This week's parsha starts off telling us about Yisro, the father-in-law of Moses, who, after having lived a life of idolatry, eventually came to see the way of G-d. Last week's parsha ended off with the story of Amalek, those bad guys who started up a war with the poor Jews. Why are these two incidents juxtaposed? Simply by way of contrast - Amalek, relative of the Jews (he was a grandson of Esau) harmed us, while Yisro, a stranger to our nation, befriended us and gave us valuable advice, as we shall see later. Read on. The first few verses tell us that Yisro sends a message to Moses that he is coming with his daughter (Moses' wife) and Moses' children. They had come from Midian; Moses had sent them there because of the trouble in Egypt. When Moses received this message, he went out to meet his father-in-law, and indeed greeted him first. He did so because of the obligation to honour one's father-in-law. There is a great lesson here - a person should learn to appreciate the fact that the parents-in-law spend much time and effort in raising their child who is now his wife (or her husband). In gratitude, a person should always treat his in-laws with proper respect. Flowers for your mother-in-law on your wife's birthday is a great idea. Yisro rejoiced over the great deeds which G-d had done on the Jews' behalf, and at the same time grieved that so many idol worshippers had met their destruction. Then he said, "Now I know that your G-d is greater than all of the idols of the world. Because the Egyptians schemed to drown all the Jewish children, G-d saved the children and drowned the Egyptians." Yisro made a feast to celebrate his own circumcision and ritual immersion, which together marked his conversion to Judaism. Why did he make a feast? In order to satisfy his body, and please it, so that a spirit of holiness would rest upon him. G-dliness does not rest upon a grieving body. We find that when Isaac wanted to bless his son he asked him to bring him good food to cheer him, so that the Divine Presence would be present at the blessing. When Yisro saw that his son-in-law Moses was judging the entire Jewish nation by himself, he told him that it was not good. He warned Moses that he was wearing away both himself and the people who needed judgements, and advised him to delegate power to subordinates who would judge the smaller cases, while Moses would judge the larger ones. Rabbi Meir Shapiro tells us that anyone can find fault with the actions of others. What is considered worthwhile? Constructive advice. The commentary Sifrei tells us that because of this advice, Yisro caused an extra chapter to be added to the Torah. Some people always find fault with the way others do things. We should learn from Yisro and suggest ways and means of improving the situation, rather than merely complaining and criticising. Apart from Yisro, the sedra also contains the Ten Commandments. The Israelites are by Mount Sinai, There was the sound of angels accompanying G-d to the mountain, and other angels blazing with lightning and fire. G-d put a huge cloud between Israel and the angels so that the Jews should not see them and be terror-stricken. The Midrash says that on the day of the Giving of the Torah the sun stood still in the sky. Many Jews died of fright, but they were resurrected by G-d.
With G-d's arrival at Mount Sinai came a great flood of smoke, like that of a furnace. There was thunder and lightning and a large cloud of fog. The mountain itself shook and trembled. The Jews trembled, too, because the earth beneath them rocked. They withdrew far away from the mountain, in fear and trepidation. Even though they were three miles away, though, they still heard clearly every word which Moses said when he spoke on the mountain. Even though the Shofar was blowing loudly, it did not overpower Moses' voice. Himself. The Jews understood only the first two, and the others required clarification from Moses, and were said over by him. All of the people witnessed these Commandments: the blind, the mute and the deaf were healed. 1 . I AM THE L-RD YOUR G-D - Who took you out of Egypt. Why did G-d not say that he had created Heaven and Earth? Because the Jewish people had not witnessed that with their own eyes. The miracle of Egypt, however, was seen by all present. 2 . YOU SHALL HAVE NO OTHER GODS BEFORE ME - This commandment mentions "you" in the singular. This is to give Moses an excuse at the incident of the Golden Calf, when he would tell G-d: "Why are you blaming the Jews? You said 'You shall have no other gods,' in the singular form. Actually, You had only forbidden me to worship idols, and not Israel!" 3 . 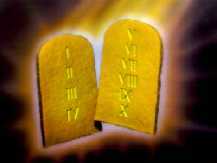 DO NOT TAKE MY NAME IN VAIN - Why does this commandment follow immediately after idolatry? To show that one who swears in vain is likened to an idolater. If he swears that "by the truth of G-d, so my words are truthful," and yet he is lying, he shows that he really considers G-d to be a lie, heaven forbid. 4 . REMEMBER THE SHABBOS - You shall work for six days, and on Shabbos you must feel as if you have completed all of your work. You should not give it another thought. One who properly keeps Shabbos will be forgiven for all his sins. 5 . HONOUR YOUR FATHER AND MOTHER -.At times, a father lives a long life, and it is difficult for his son to honour him properly. Therefore the Torah assures us that if we honour our parents, we will live long. 6 . DO NOT KILL - Even though there are billions of people in the world, one is not even allowed to reduce this number by one. 7 . DO NOT COMMIT ADULTERY - Why does this follow "Do not Kill'? So that a person should know that just as you can't decrease the number of people in the world by the sin of murder, neither can you can increase it by the sin of adultery. 8 . DO NOT STEAL - A person must not think that although murder is forbidden, it is still permissible to abduct a person and sell him into slavery, and so the Torah now gives this commandment, which is an admonition against abduction and kidnapping. 9 . DO NOT BEAR FALSE WITNESS - A person might want to think that it is indeed forbidden to steal outright or cause bodily harm, but one may steal someone's money by giving false testimony. Hence this admonition, telling us not to harm another with words. 10 . DO NOT COVET - A person might think that he can, at the very least, harm another in his own thoughts, so we are warned here not to covet our friend's possessions in our hearts. There is no commandment about theft because if we know that we are prohibited even from coveting another's possessions, how much more so is it prohibited to steal them! On Rosh Hashanah, a short while after Rabbi Yitschok Zev Soloveitchik became the Rabbi of Brisk, a group of soldiers came to him before the blowing of the Shofar. They told him that a Jewish soldier had fallen asleep while on sentry duty and was sentenced to be shot that day. The prisoner requested the opportunity to speak to a Rabbi before he died. The anti-Semitic officers added that if the Rabbi would not come, they would shoot the people of the town. Nevertheless, Rabbi Soloveitchik refused to go with them. The people of the town were puzzled by their Rabbi's refusal to speak to the prisoner. Moreover, his refusal was endangering the lives of others. A second group of officers came to the Brisker Rav and repeated the same request as before. Again Rabbi Soloveitchik refused to go with them. The people of the town were astounded by their newly-appointed Rabbi's conduct. Even when they begged him to change his mind, the Brisker Rav refused to go. Finally, when a third group of officers came to the Brisker Rav, the inhabitants of Brisk were so sure that now they would be punished for what seemed to be their Rabbi's foolhardy intransigence. To their great relief, the officers announced that the Brisker Rav was no longer needed. The prisoner's family had meanwhile appealed to a higher court, and the execution was stayed. Everyone was amazed at what appeared to be a miracle, and they asked the Brisker Rav for his comment. "I merely followed the directives of the Rambam," replied the Brisker Rav. "The Rambam writes that if a fellow Jew does not deserve capital punishment, we are forbidden to hand him over to be killed even if our lives will be put in danger. This unfortunate fellow did not deserve to be killed; he wasn't starting a revolution. Had I gone to him, it would have caused his death, for immediately afterwards they would have shot him; I therefore had no right to go. Because I followed the halacha, I saved this person's life."